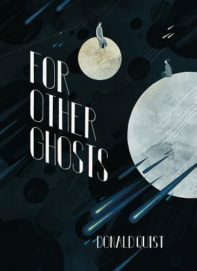 Donald Quist’s For Other Ghosts follows a path traced by his award-winning nonfiction collection Harbors: narrative as a map and its trajectory as a layered rather than a linear move. Present are the disciplined narrative control, the intelligent caprice that holds onto the handlebars by its fingertips while flying down a hillside. More than his previous works though, this book emphasizes the contemplative over the confrontational. These stories investigate the proposition that linear mobility takes for granted: we are inclusive bodies moving to locations that seem to have nothing better to do than wait for us. In rebuttal, Quist’s stories suggest that the location, the person, and the event occur in each moment—that we live in a lineage of shadows rather than straight lines. The discipline displays itself most furtively in the “false flags” Quist throws up, repeated techniques that distract from the true mechanism at work. He places these throughout his stories as gestures more than clues; the idea that answers would be so easy is part of the answer. For example, in “Takeaway,” Jason and Nahm, a married couple, meet their in-laws at a restaurant in Bangkok. The couple’s differing racial and economic backgrounds serve as a surface vehicle for the narrative, and are emphasized by a political protest taking place outside (the crowd’s chant “No vote” repeats onto a tense silence at the dinner table). These things seem like simple domestic angst, the exterior complementing the interior, but the real “takeaway” occurs during what seems like an insignificant moment of characterization: “During those long hours she [Nahm] would stare down at one of the cracks in the grimy sidewalk and count the number of expensive shoes that passed over, or she’d look up at the tangled thicket of telephone wires running above her head and imagine where each line finished and began.” The “telephone wires” appear later in the story during a flashback to one of Jason and Nahm’s earliest meetings: “Outside the building near the revolving doors, Nahm seemed preoccupied with the telephone wires above. . . . Jason asked what she saw, and she replied openly, ‘I’m thinking about the messages going over my head. I’m trying to imagine the senders and receivers.’” The gesture of looking for something invisible to explain the visible occurs multiple times in Quist’s collection; it’s the ethereal infrastructure that carries true valence. DaYana closes the door behind her as she leaves. The conversation ends there, but the messages in the telephone wires have no beginning or end. Ghosts have no coattails and shadows no lineage. Although chasing a specter seems like a fruitless endeavor, Quist’s characters engage with the ineffable, attempt to re-understand what the “individual” means in relation to it. Does one become a ghost in the process of chasing a ghost? How much of ourselves are built on the foundation of ghosts? In the final story in the collection, “The Ghosts of Takahiro Okyo,” Yamamoto, the chief of park rangers in Japan’s Suicide Forest, is charged with the unenviable task of collecting the dead. One of his rangers, Daisuke, contemplates the irresolvable atmosphere of a location that is forced to absorb the conceits of thousands: “Hundreds of confessions, the secrets kept by the undergrowth, were rooted in the soil and traveled the lengths of Japan like telephone wires.” (His contemplation becomes ever more eerie when compared to Nahm’s similar reverie as she gazes skyward at Bangkok’s electrical lines.) Chief Yamamoto, meanwhile, is haunted by the disappearance of a coworker, Takahiro, whose uncanny knack for finding the dead has earned him the nickname “god of death.” Quist’s narrative moves between the three rangers, but nothing is resolved by this shifting perspective. If anything, the story seems to fold further into a growing mise en abyme, until the beginning and end are indiscernible. Taken as a whole, Quist’s stories are inclusive entities that only lightly touch on each other. On the surface, the organization seems ill-suited, the stories awkward in juxtaposition, but they are all connected. The connection is in the feeling created by his unique noir style, one that embraces a genuine sincerity in narrative exposition. It’s a style that acts as a kind of tone, a cadence that connects his characters variegated storylines: an ethereal geography of sound moving over an uncrossable crevasse separating singular entities staring at each other across a yawning depth.